Gov. Brian Kemp delivers his first State of the State address, Thursday, Jan. 17, 2019, in Atlanta. Updated: Jan. 17, 2019, 6:43 p.m.
ATLANTA — Georgia’s newly elected Republican governor announced during his State of the State speech Thursday that he was setting aside $1 million to create a waiver plan that would give the state more flexibility in using federal Medicaid funding. Kemp did not elaborate about what the waiver might include and questions emailed to his office were not answered. Medicaid strategies that some Republican-led states have talked about include partially expanding the program to cover only residents below the poverty line, a less generous option than provided by the 2010 Affordable Care Act, which extended eligibility to many people just above poverty as well. Georgia’s previous Republican Gov. Nathan Deal opposed Medicaid expansion on the grounds that if federal funding ceased, the state would be left to fully pay the costs. Kemp said the state of health care in rural Georgia was particularly concerning. “Seventy-nine counties have no OB/GYN. Sixty-four counties have no pediatrician. Nine counties have no doctor,” Kemp said. Some Republicans in Georgia have become more receptive to the idea of expanding Medicaid access by seeking a waiver in recent years but have also called for restrictions like a work requirement. Democratic state Sen. Harold Jones said in response to Kemp that Medicaid expansion, not a waiver, was the right path forward for Georgia. Jones said expansion was the only way to help struggling families and struggling hospitals. Kemp also touched on previously unveiled plans to increase teacher pay, funding for school safety and resources for combatting gang activity in his speech. Kemp laid out a proposal to permanently increase teacher salaries by $3,000 for all certified Georgia teachers, which he said was a “sizeable down payment” on his campaign promise to raise pay by $5,000. 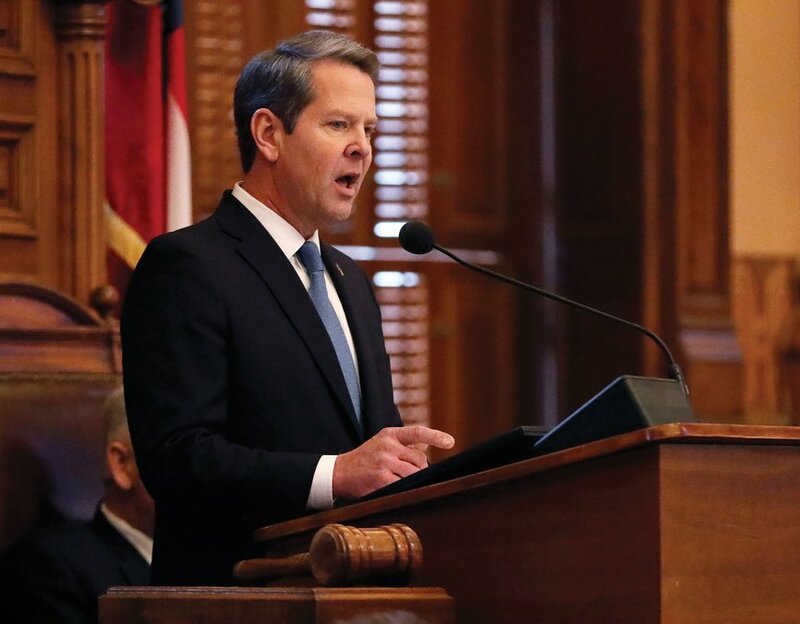 Kemp touted plans to allocate money to each Georgia public school for safety measures and an anti-gang task force within the Georgia Bureau of Investigation. He’s seeking $30,000 for each public school in the state — a total cost of $69 million — to enact safety measures determined at the local level. Kemp also said he plans to address mental health within schools and provide extra resources. Kemp said he wants to put $500,000 in initial funding toward the new GBI anti-gang task force. The last pitch morphed into “track and deport drug cartel kingpins” in his State of the State address, while the other issues went unaddressed.